Cultural Landscapes Blog›What 'should' the future landscape of Devon be like? What 'should' the future landscape of Devon be like? The key to understanding processes on a local scale is often not in academic literature and government reports: it is the knowledge and behavior of local land managers and practitioners, or in HERCULES jargon: local stakeholders. What do they see as the largest threats to the quality of the landscape? How do they project the future and most importantly, what should the future landscape of Devon be like? To find answers to these questions we organized a workshop to discuss the future of the landscape, present our preliminary findings - based on academic literature and government reports - and construct a preferred future scenario. The importance of engaging with local stakeholders became apparent the very minute we started the workshop. Already in the introduction round several attendees let us know that they were surprised not to be involved in the process in an earlier stage of the project. How were we able to say meaningful things about the local landscape if we did not first talk to the parish council or influential groups like the Campaign to Protect Rural England? And will they ever hear from us again after this workshop? Stakeholder engagement requires a good deal of listening, patience, and dialogue. This workshop was organized to specifically learn from these local stakeholders, to integrate their input into our models of landscape change, and we learned how important it is to communicate clearly and promptly with stakeholders beforehand so that we were all on the same page on the day. Early tensions evaporated as we got on with the business at hand, and the remainder of the workshop was extremely productive and fruitful. One of the key insights from the stakeholders was that the landscape should not be seen as a museum of ancient farming. As conservation professional aptly put it: South West Devon is an area of outstanding agricultural beauty – not an Area of Outstanding Natural Beauty (a conservation designation in the U.K). Cultural heritage, biodiversity and healthy ecosystems should be protected, but only in combination with commercially viable agriculture. To ensure such a future scenario a working subsidy scheme is indispensable, but in combination with more market-driven options, such as a wood-fuel incentive for environmentally friendly hedgerow management. 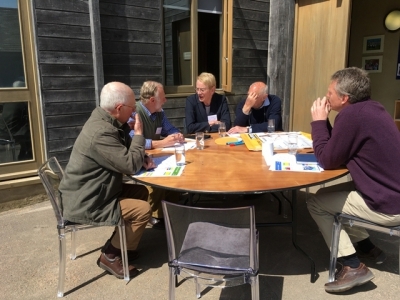 We will use all the input from this workshop, and combine it with results of a survey amongst 75 land managers in South West Devon to formulate and discuss meaningful future scenarios regarding the quality of the landscape to assist local policy making. Reports on the outcome of this study will be published on this website shortly!